This weeks post is an introduction of a (well known) Swedish company. After several guidance adjustments, the company has disappointed some investors and the share has dropped significantly; potentially by too far? We will try to give an overview of the business itself. Sweden-based Elekta develops, manufactures, and distributes treatment planning systems for neurosurgery and radiotherapy, including stereotactic radiosurgery and brachytherapy. The company’s platforms and software are used in more than 6,000 hospitals globally. Its headquarters are located in Stockholm. It is easily visible that Elekta operates in the Americas, Eurasia and Asia Pacific in about the same dimension. North and South America are the world’s largest market for radiation therapy: Elekta is the #1 in software and brachytherapy and #2 in the markets for linear accelerators (following Varian, controlling e.g. 70% of the US market). It is the market leader in the EMEA area with potential in the Middle East and some weakness in Russia. Asia Pacific offers the strongest opportunities for the company. Not only is Elekta the market leader, its growth potential in China is still remarkable. Elekta’s customers for its oncology and neurosurgery solutions are over 6000 hospitals worldwide, primarily public care providers, but also a growing portion of private care providers specializing in radio therapy. Elekta also trains its customers in using their products and includes their feedback in their R&D process. The company has recently invested in salesforce.com which is known for its customer relationship management program, providing detailed analysis of the sales force and accomplished deals, thereby curbing up efficiency in the sales process. Elekta sells mainly through its own sales organization which constitutes 17% of overall employees. The sources of revenue are: hardware, software and system sales (hardware + software). Sales often stem from ongoing service contracts. 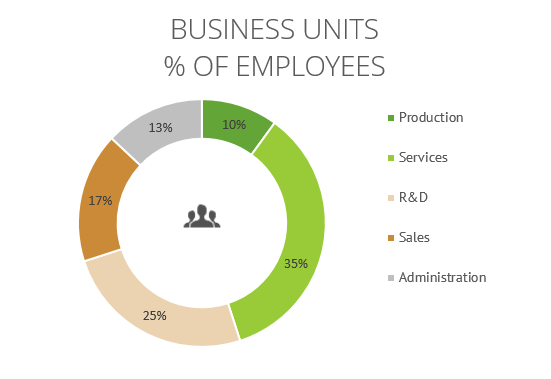 A large and very important part of Elekta’s business model is its services sector (35% of employees). Its primary purpose is to maintain and develop equipment and software installed in clinics. This includes the prevention of downtime and the increase of customer efficiency. The former makes Elekta’s running service especially crucial to customers. Elekta uses these relationships to sell accessories, upgrades, more services and new systems. Services are organized globally (about 700 employees). The nature of competition differs in the various operating areas. The most important competitor globally is Varian Medical Systems (NYSE:VAR). It also manufactures medical devices and software for treating cancer and other medical conditions with radiotherapy, radiosurgery, proton therapy and brachytherapy. As mentioned, it is very well established in the US market and takes up 70% of the radio therapy market share (50% of global RT market). For radiosurgery, Accuray (NASDAQ:ARAY) is another notable competitor, that develops, manufactures, sells and supports treatment solutions (radiosurgery, stereotactic body radiation therapy, intensity modulated radiation therapy, image guided radiation therapy and adaptive radiation therapy) and can therefore be considered a niche peer. For brachytherapy, competitors are Phillips (Pinnacle treatment planning tools, integrated photon, electron, stereotactic, brachytherapy, simulation, image fusion, IMRT options and most recently VMAT planning) and Raysearch (STO:RAY-B) (RayStation treatment planning platform). There is a greater variety of Hospital Information System (HIS) companies in the IT business, whereby cancer care is only one of many specialities. The business of radio therapy is highly protected by barriers of entry through intellectual property and technological know-how. As we have shown before, through services area that includes maintenance, switching costs are also massive. As a consequence, we have seen very strong consolidation in the sector. In the US market, Varian and Elekta have formed a stronghold protected by these barriers. When doing further research to compare the individual products (on the basis of personal experience reports given by MDs) it cannot be denied that the portfolios are very similar in nature. Radiation therapy (RT) still lags behind the attractiveness of cancer drugs. Even though RT offers a cost-efficient way of fighting certain kinds of cancer, its side effects seem rare but consistent. This does not mean that improvements cannot be made in the future. Morningstar estimates that 95% of the world’s RT equipment installations will be provided by Varian and Elekta over the next decade, partly enabled by Siemens’ exit from the industry in 2012. The company itself lists four levels on which its success will ultimately depend. The first is the research and development level with regard to all products, software and services. Especially on the IT level, solutions such as MOSAIQ have to be developed quickly. The second level is the sales and marketing level which can be argued is not as sophisticated as the R&D and less reliant on special individuals. The third level is the lifecycle management which plays into the services strategy. 45% of sales are made up by software and services and synergies are very valuable to the costumer on an efficiency bases and to Elekta on a recurring sales and growth basis. The fourth level of intrinsic growth is based on the success of the former three but also strategies like evidence-based medicine and training. The emerging markets, particularly China could be a welcome customer. The Asia/Pacific marketplace could support up to 5’000 new linac (linear accelerator) installations, according to Morningstar. In the USA, the Centers for Medicare/Medicaid Services (CMS), a federal US agency, control government funds spent on medical equipment. It is their decision which products will be paid for, but as long as Varian and Elekta offer the most suitable options, the situation should not be problematic. The increasing power of large hospital networks will have an impact on the choice of supplier. This could either turn out positively or negatively. Western Europe will depend on government’s decisions to increase RT support. Obviously, the cancer treatment (and medical overall) appears as a sector that is almost immune to broad economic trends due to its importance to the patients. Cyclicality could merely stem from government decisions on health care spending resulting in periods where more new devices are employed or systems are updated. A change in recognized services on the side of the health insurer seems highly unlikely. While the US market seems to be a rather safe, and Europe (ex UK) at least stable, a visible threat is the aggressive competition in emerging markets. Customers have been declared to be more cost-conscious and therefore pushing competition and lowering margins. Forex depreciation in these markets is possible due to a strong US Dollar. Mr. Laurent Leksell is a SSE graduate. He is the founder of Elekta and the board chairman, owning 14,250,000 A-shares, 8,856,624 B-shares, 3,562,500 A-convertibles and 2,500,681 B-convertibles. 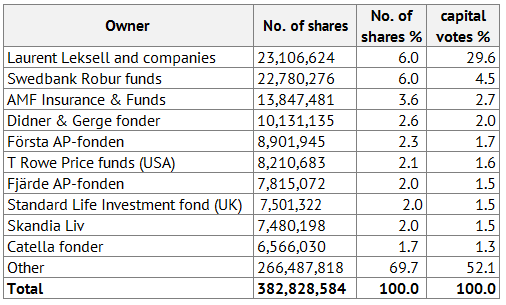 He is the company’s largest shareholder. It is remarkable how much effort is put into explaining the corporate governance structures in the annual report. It shows a scheme of how the board and the auditor interact and lists the boards most important members with days of attendance in board meetings as well as their total compensation. Overall, the corporate governance report seems to be very transparent, but I do not have any opinions on the management yet. P/S lies at 1.82 compared to 2.88 for Varian and 1.52 for Accuray. P/B is at 3.11 compared to 5.50 for Varian and 5.58 for Accuray. Elekta trades at a P/E of 37.40 against P/E of 46.26 for RaySearch and 21.93 for Varian. Earnings multiples are high due to the earnings decline while when focussing on other fundamentals, the company looks rather undervalued. However, this is of course just a quick glance. One risk for Elekta is the change of the competitive landscape. Technical shifts occur as well as continuous improvements of industrial know-how. Constant development is crucial in this industry. In its risk report, it states: “The Company’s continued success is dependent on the ability to establish and maintain successful relationships with customers.” Elekta’s delivery of treatment equipment relies on customers’ readiness to receive the delivery at site. Depending on contractual payment terms a delay can result in postponed invoicing and also affect timing of revenue recognition. The Group’s credit risks are normally limited since customer operations are, to a large extent, financed either directly or indirectly by public funds. We will have to learn much more about the sector and the industry in general to make better judgements. Also, this is not as easy to comprehend as Coca Cola, to be fair. The next two posts are going to make more precise conclusions; we have full valuations coming up, stay tuned. Questions to the audience: What are your future expectations for Elekta? What is your guess for development of demand in China? You might also consider Intuitive Surgical and robotic surgery in general as a competitor. RT is a very blunt treatment that has whole-of-body side effects. Surgical procedures are much more targeted, and could thus garner an increasing share of the market over time as the cost of the procedures continues to fall. If early diagnosis is a growing trend then this could lead to the use of more surgery versus RT. Thanks for your reply. This older NYT article makes some remarks on the higher costs of robotic surgery, stating that the results are not known to be superior at the time of publication. From what I have read, robotic surgery is not yet on an appropriate level, but will definitely play a role in the future, as implementation costs may decrease. Wow, this will be a good read! I have owned a rather large post in Elekta since many years – so its still a good investment for me, but the recent decline worries me of course. Thanks for this! Thanks for your message! Greatly appreciated. Thanks for the nice writeup. Did you look also into German medtech companies such as Stratec Biomedical or Carl Zeiss Meditec? And by the way, your website looks and feels great, do you use a special homepage toolbox which you may recommend? I did not look into these yet, but I expect them to be a little more complex to understand. Generally, we might publish a bit more on German companies in the future, but it depends on what we find. For the homepage we simply use wordpress with a commercial design. There are many professional templates available in the store.